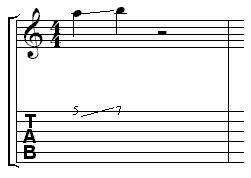 Sliding is a form of legato (smooth playing) that is similar to hammer-ons and pull-offs. The technique involves playing a note and then moving the finger to a different fret (keeping the finger pressed firmly against the fretboard as you move). The slide should sound like a swift transition from the 5th fret through to the 7th fret. The finger should remain pressed against the fretboard at all times, otherwise the sound will be cut.